Alright, confession time. Baseball is my favorite sport. People often ask what my favorite sport is, and I reply that basketball is my favorite to broadcast but baseball is my favorite sport overall. Like many fans though, if you look only at the collegiate level, I’d much rather check out a college football or basketball contest than one on the diamond. There are probably a variety of reasons for this, but the main one is that college baseball just isn’t that big around here. And by around here, I mean anywhere in the Midwest. Not surprisingly, college baseball has been dominated by warm weather teams. Big Ten and MAC schools do not traditionally have national success in the grand ole’ pastime. Some of my fondest memories of college are of broadcasting Ball State baseball games on the student-run radio station. But when I was able to broadcast for the football team my senior, well, that was on a whole different level. However, this is beginning to change. College baseball is starting to beckon for a greater portion of my rooting interest. Obviously, what is spurring the topic of this column is the unexpected and unparalleled success of Tracy Smith’s IU baseball program. If you haven’t heard, the Hoosiers will be making their first ever trip to Omaha, Neb., to take part in the NCAA College World Series this week. IU is one of just eight teams remaining, and the Hoosiers will be the Big Ten Conference’s first representative in the Series since 1984. That means that nearly a generation of baseball fans, including yours truly, were not around the last time a Big Ten university took part in college baseball’s grandest stage, and that is a shame. Although I watch Major League Baseball every opportunity I get, I often bypass college baseball on TV. I simply didn’t have any teams to root for or against. Last year, Kent State also made a shocking run into the World Series and, for the first time, I found myself actively watching until the Golden Flashes were bounced. This time around, I have a vested interest in what is taking place 600 miles away. 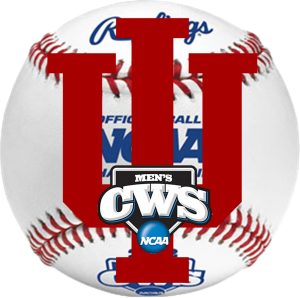 Although time will tell whether Kent State and IU are just one-time blips on the baseball map, I have a feeling that they are not. Warm weather teams have a distinct baseball advantage because they can play outdoors all year long. They also are able to play more home games for the first month of the season while teams like IU are forced to play roughly the first 20 games of their season on the road, which equates to nearly a quarter of the season. With the weather forcing northern teams to play on the road, the RPI rankings, which factor into postseason seeding, often hamper the cold weather teams. Nothing I’m saying here is breaking news for college baseball fans, but it does help illustrate why college baseball isn’t as successful in Indiana and other parts of the Midwest. Fortunately, the game is starting to show signs of a bit more parity. A few years back, the NCAA instituted uniform spring practice and official start dates to the baseball season. While some feel that the mid-February start date is still too early to begin the season, at least it prevents the Florida’s and Texas’ of the world from getting an unfair jump on the season. In-state universities are also starting to pump more money into their baseball programs. Purdue has a brand-new baseball stadium and Ball State has plans to significantly upgrade their decadent Ball Diamond (Side note: I’d LOVE to see it renamed “Ball Park”). This season, after years of delay, IU opened up its glistening Bart Kaufman Field which will surely attract bigger and better recruits to Bloomington. The talent is already here in the state. Look no further than this year’s Major League Baseball Draft to see the 24 players who were chosen by big league clubs who either played high school or college ball in the state. College baseball in Indiana will probably never overtake basketball or football in popularity. But the game’s stock is on the rise. So whether you are a Fighting Irish, Boilermaker, Cardinal, Wolverine, Buckeye or Spartan, root for the Hoosiers this week in Omaha. It could be another 29 years before you have the opportunity to pull for a Big Ten team in June. But something tells me it will be much sooner than that. The Hoosiers currently sit third in the standings, trailing only Duke and Alabama. Due to IU’s success on the diamond, it appears that Louisville might be the only team able to overtake them in the final standings. Hoosier fans may soon be able to claim that they really are #1.